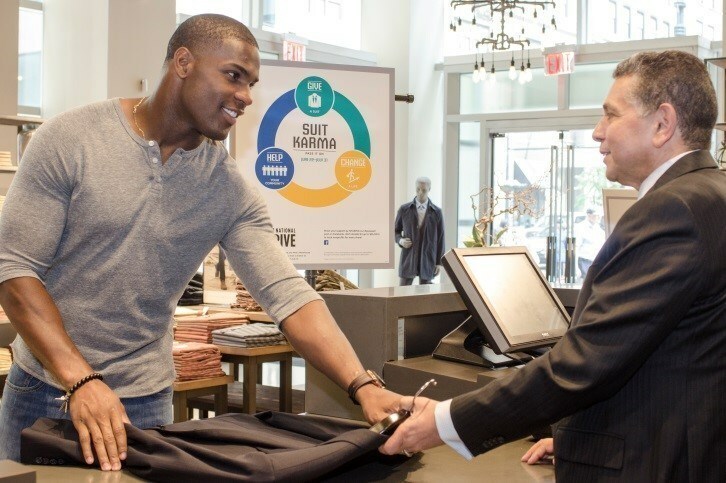 This year’s Men’s Wearhouse National Suit Drive was a record-breaker. Although it narrowly missed its ambitious goal of collecting 250,000 gently worn suits, sportcoats, slacks, dress shirts, shoes and accessories for underprivileged men who need professional attire, it still yielded the largest annual collection to date and sent the total number of items collected since the program started in 2008 to the one million mark. This year’s campaign began June 22 and ran through July 31. As usual, it encouraged Americans to donate to any of the more than 900 Men’s Wearhouse locations across the country. The collected items were then given to more than 180 local non-profit organizations that distribute the articles of clothing, and provide job-ready skills, training and seminars to disadvantaged people entering or re-entering the workforce. DeMarco Murray, running back of the Philadelphia Eagles, and the National Basketball Coaches Association (NBCA) helped promote this year’s drive.